This was a blog by yoga teacher Kathleen Reynolds of Allay Yoga. https://musepracticeallay.wordpress.com/2015/04/01/dharma-discussion-seva/. Kathleen introduces Lauren Rubenstein from Go Give Yoga, the organization to which Kathleen donates all proceeds from her monthly Early Morning Meditation Classes. Seva is a Sanskrit word often translated as “selfless service.” For me, the spirit of such a concept is best understood in its demonstration rather than its dissection. 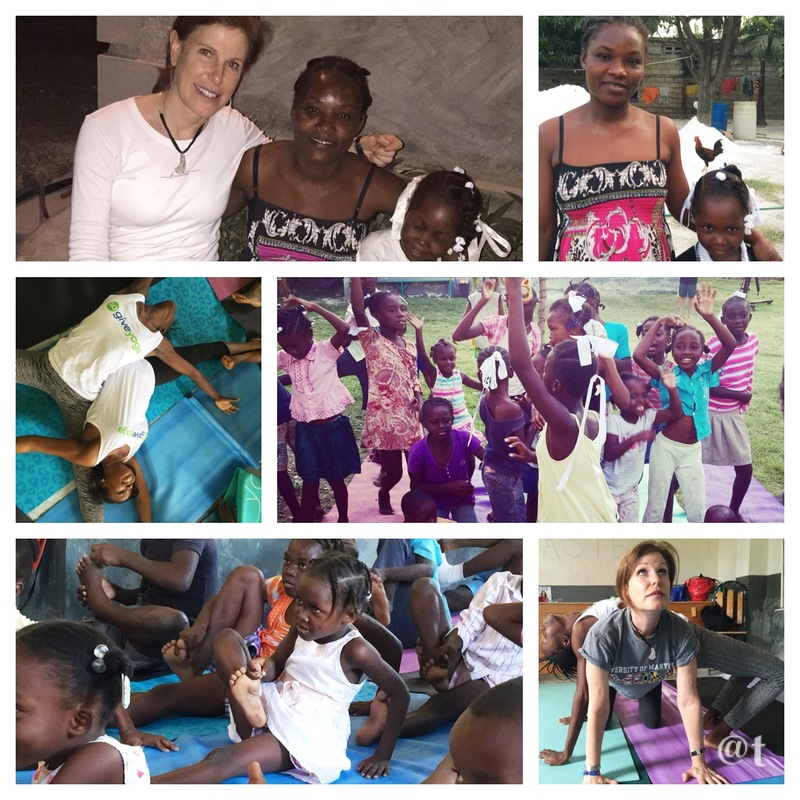 For this reason, I am happy to offer this space to Lauren Rubenstein who just recently returned from her seventh seva trip to Haiti with Go Give Yoga. I first learned of the work of Go Give Yoga when Lauren presented on a panel during my yoga teacher training. If you are interested in learning more about Go Give Yoga, please visit http://www.gogiveyoga.com. I am honored in my own very small way to support their work by teaching the monthly early morning meditation classes at Allay on the second Tuesday of each month — all donations from these sessions go to Go Give Yoga. Duvennes, Michelda’s younger brother, in savasana. 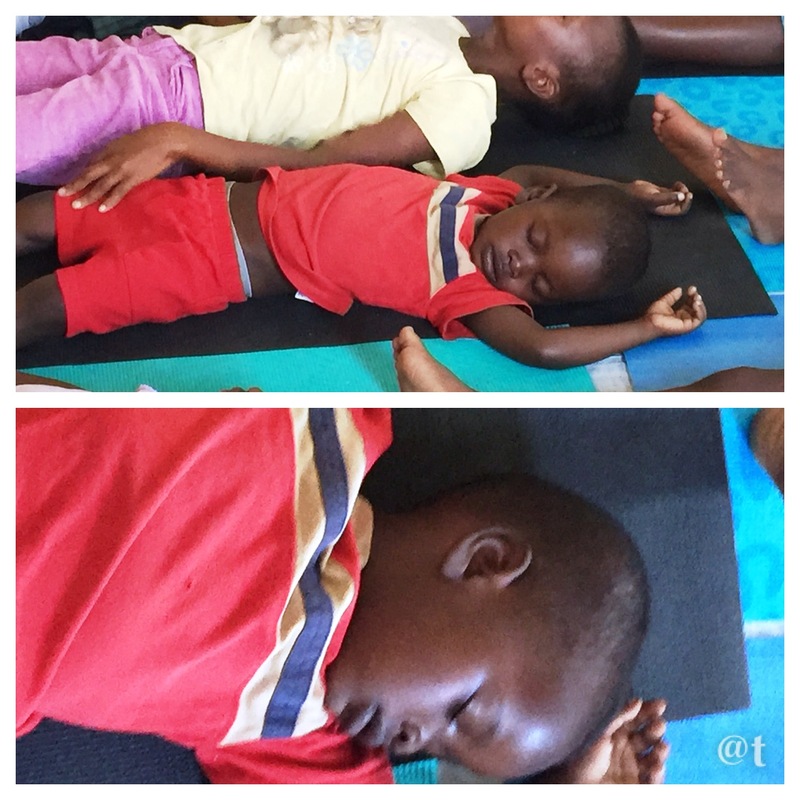 The kids often fall asleep; many don’t have real beds to sleep on, or space of their own, and the mat provides their own space, even if only for an hour. Seven seva trips to Haiti later, I am so grateful for two of the more impulsive decisions in my life: to take a children’s yoga teacher training in 2009, unclear why I was doing it; and to sign on for a Haiti trip with Go Give Yoga in July 2011. The first trip was monumental. I truly had no clue about Haiti or any other “Third World” country. Conditions in the post-earthquake tent camp were shocking. Even as I was trying to process what I was experiencing, I kept thinking with frustration, there will be no words to describe this situation once I return home. 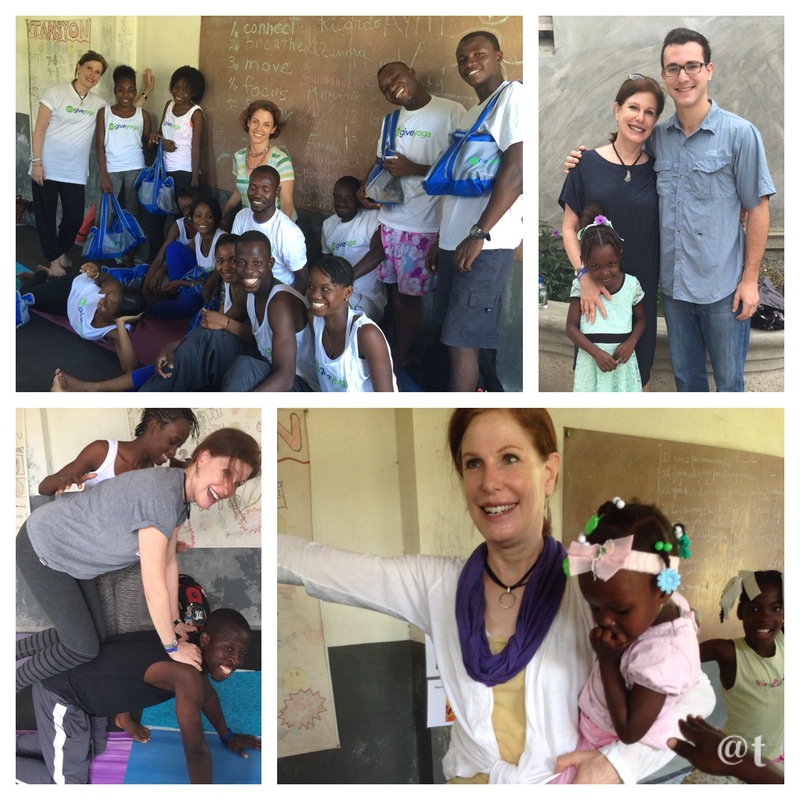 Four years ago, Go Give Yoga went to Haiti with the idea that teaching yoga to children who lived in extreme poverty and had experienced a tragic earthquake just might be a way to serve. Staying on the grounds of Partners In Development (www.pidonline.org), a nonprofit that provides free medical care, a child sponsorship program, small business development and other wrap-around services, we worked alongside medical volunteers. During shared meals, some of them loved to recall in graphic detail what they had seen in the clinic. We heard from Mr. Genois, PID’s social worker who is tasked with determining which family’s needs — all dire — should take priority. For example, if someone told him their tent was leaking and they had to sleep standing up when it rained, he would wait until the next rain and check it out. In other words, a job that would break most people’s hearts. For the most part, the children we teach don’t get much adult attention. Many of their parents are out sun-up to sundown trying to sell something on the open market so they can give their kids a hot meal that day — something the children cannot take for granted. Most school in Haiti is private, and many families simply cannot afford tuition, uniforms and books. Clean drinking water is a luxury. We quickly learned that the children were coming to yoga hungry and thirsty, so we incorporated a hot meal program. We did arts and crafts with the kids after yoga. The first time I cried was when we gave the children drawing materials, and so many of them drew houses…. But it wasn’t all trauma and tears. The overwhelming majority of the children we taught positively lit up with joy during yoga. Despite the language barrier which required translators, our experience confirmed what know: that yoga is about connection — to one’s own wholeness, and to each other. Some of the most poignant moments were looking into a child’s eyes during partner poses, as we were hand-to-hand or foot-to-foot. Holding the little girl who never cracked a smile and would not lie down during savasana (Michelda stole my heart and I have been sponsoring her through PID ever since). Spontaneously doing yoga with kids who show up between classes, when there is no interpreter, just gesture and touch. Indeed, neuroscientists appreciate how important this non-verbal, “right brain to right brain” connection is to human development. The cultural divide also gave pause, especially once I started educating myself about Haiti. There’s a term in social work, “well-meaning white woman.” What could outsiders like us who could never hope to fully understand this culture possibly have to offer? How could we reassure parents and teachers who deeply suspected that yoga was about teaching kids to levitate, or getting the spirit to leave the body? On the other hand, wasn’t yoga an equally foreign practice when it first came to the U.S. from India? Like any subject, the more I learn about Haiti, its culture and history, the more I feel humbled by what I don’t know. And yet. Trip #7 felt like a watershed, a breakthrough of cultural barriers. ~PID’s cook, a conservative Christian woman whose church forbids women to wear pants, makeup, jewelry or nail polish (as I learned when I started painting the girls’ nails and an older girl came over and signed that their parents would punish them for it), began to attend class. I had shown her downward dog on a previous trip, as a possible way to ameliorate her leg pain. ~A local pastor told us yoga was helping him with his sermons. ~The older teens and school teachers we had trained to teach yoga were moving ahead full speed, teaching classes in their communities. ~Most poignantly, the kids were teaching each other — and us! Nine-year-old Alexandra assembled a group of 18 and taught an impromptu class. Six-year-old Miranda conducted a private session for the 15-year-old American “brother” of her American sponsor family. When I looked and saw Miranda sitting face-to-face and leading Miles in meditation, following by asana and ending with savasana, yoga again proved to be a profound form of non-verbal connection. In what is sometimes referred to as the “Republic of NGOs,” aide workers are criticized for driving around Haiti in shiny black SUVs, their feet never touching the ground. Go Give Yoga is on the ground in Haiti, literally as well as figuratively. Are we helping or fixing Haiti? Definitely not – nor is that our intention. Are we serving Haiti by offering our presence? By sharing a practice that might grow inner resources in some of the least-resourced children? From the bottom of our hearts, we hope so. The 4 Roses practice has been adapted for families from Rick Hanson’s inspiring work in Hardwiring Happiness. ROSE is a simple process for engraving the good things that we experience over the course of the day into the neural structure of our brain. It is a profound Mindful Parenting practice that the entire family will enjoy! Recognize 4 Roses each day – A rose does not have to be a grand experience. Good things happen all around us, but much of the time we don’t notice them. Take the time, that singular moment, to recognize that the sun is shining, that your house feels warm, the smell of your coffee in the morning, or the feeling of your child’s small hand in yours. We can’t change the past or the future, but we can take in the good during this moment. Observe how this recognition makes your body feel. Where in your body do you feel it – does the moment cause your belly to soften, or does your heart seem to flutter just a bit? Does it cause you warmth, or give you chills and goose bumps? Take that extra second, from when you recognize the moment, to observe the impact on your body. Soak it in and savor this experience. Let your attention remain focused on the way your dog wags her tail when she sees you, before moving on to your next thought. Unless we bring conscious awareness to good experiences, they bounce right off of us (remember our brain is more sensitive to the bad then the good). We have to hold our attention on these good experiences for several seconds to make them stick. The longer a positive experience is held in our awareness, the more emotionally stimulating it is. This allows the neurons in our brain to fire, and thus wire together. Engrave it into your being. The old saying about creating a goal is that if you share it, that goal becomes much more likely to be obtained. Similarly, in order to engrave these good experiences into the neural structure of your brain it is vital to go one step further with them. That step is to share these roses with your family over dinner, or write them down before you go to bed. This exercise can be particularly valuable for kids who suffer from anxiety, as they tend to downplay or ignore good news. It is also valuable for kids whose attention tends to bounce rapidly from one thing to the next and thus don’t give positive experiences a chance to reside in their brain for any length of time. With kids and grownups alike, it is important to encourage pausing here and there and noticing the good things in our lives. At birth, the human brain is in a remarkably unfinished state. Most of its 100 billion neurons are not yet connected in networks. Connections among neurons are formed as a growing child experiences the surrounding world and forms attachments to parents, family members and other caregivers. These connections form an elaborate network that is sometimes referred to as the brain’s “wiring” or “circuitry.” All of our thoughts, experiences and interactions create connections – they shape the neural structure in our brain. Our emotions of love, worry, joy, frustration or anxiety also make physical changes in our neural structures. Even when we are not experiencing an event, our thoughts about an event use the same neural pathways as when we are experiencing it. So if I lie in bed dreading about tomorrow’s dentist appointment, these neural pathways are developing similar to how they will while I am in the dentist’s chair. When we have prolonged or repeated mental activity we leave an enduring imprint on our neural structure. Thus a state can become a trait. Our goal through the 4 ROSE practice is to bring conscious awareness to positive experiences so they can create lasting positive emotions to help create a more positive, happier and optimistic brain. Similar to our five minutes of breathing, this process is simple, but not entirely easy. Provide yourself the opportunity to re-shape your brain in a wonderfully powerful way. I challenge you to engage in an experiment with your family. Challenge your kids and yourself to find 4 roses everyday during the school week. Each night at dinner, share your experiences and see how this small practice can make a big difference in your life and in the lives of your children! Proverb – If you can take care of the minutes the years will take care of themselves. Dr. Kristen Race is the author of Mindful Parenting and founder of Mindful Life. Reference: Hanson, R (2013) Hardwiring Happiness: The New brain Science of Contentment, Calm and Confidence. New York, NY: Harmony. I would love to see Visiting Feelings in every school library and counselor’s office! Rubenstein, Lauren. Visiting Feelings. illus. by Shelly Hehenberger. 32p. Magination. 2013. Tr $14.95. ISBN 9781433813399. LC 2013001222. Researchers have long known that emotions are connected to a range of physiological changes, from nervous job candidates’ sweaty palms to the racing pulse that results from hearing a strange noise at night. But new research reveals that emotional states are universally associated with certain bodily sensations, regardless of individuals’ culture or language.